Recorded at Fryshuset, Stockholm, Sweden, August 23, 2005. 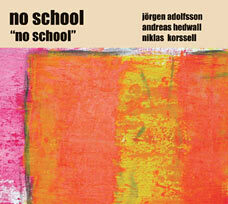 No School tells a story, or more correctly stories. Sometimes they speak, successfully, all the time. All chapters put side by side create a kind of road of refinement and conquest of the epithet “free”. One who is knowledgeable in reading and listening can join, bewildered, charmed, disturbed – but never unaffected, because the chapters and the tracks invite us to free interpretation and free listening. Their playing shines with energy.